Those learning how to bead will quickly discover that most projects require seed beads. Roughly eleven seed beads fit into one inch. These seed beads come in many colors and can be made of plastic or glass. One thing to take note of is that the cheaper the bead is, the more likely it is to vary in size and color. Also cheap beads may not necessarily fit through every needle. Don't worry, this scenario is the usual. That is why most expert beaders recommend that beads be bought in a single color and in bulk. You are advised not to buy beads in packages containing many different colored beads as this can cost you hours of time sorting them into their different color categories. Beginners should also take care to buy segmented plastic containers to keep threads and beads organized. You'll also need beading needles. Regular sewing needles will almost always be too large to fit through the holes of most beads. Pretty much no seed bead will allow a normal needle. Those just learning how to bead should take care to make sure that the needles they buy are actually beading needles. Most beading experts also recommend that you buy a good pair of small scissors that you will reserve for beading purposes only. 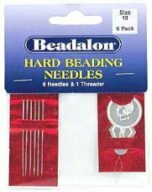 Another useful tool for those just learning how to bead are Singer brand needle threaders. Beginners are better off with stringing their projects on inexpensive beading thread. Embroidery thread is not advised as it is too flossy and catches on the bead. Regular sewing thread is also not advised because it tends to fray and tangle. If you can't follow these beading instructions, then you can improve the quality of regular thread by rubbing it with beeswax. This may stop it from fraying when you thread the beads. There are several good sites on the net that can teach you more about bead techniques. So many provide free beading instructions and patterns that it would be ridiculous to try and name them all here. However, quick surf did reveal a couple of choice sites. An excellent how to bead site is kimberlychapman.com. This great source of step by step beading instructions will not only show you how to bead, but you'll learn different stitches and patterns too. This site also provides beading instructions for patterns such as the Goddess key chain, Winnie the Pooh and King Tut's mask. Simple Lace and Other Beaded Jewelry Patterns by Mary Ellen Harte. Your library or local retailer is an excellent source of these kinds of how to bead craft books. Arts And Crafts Secrets (an email newsletter) is packed with FREE new crafts ideas, tips, and suggestions.